Disappearing audits and reader service cards, questionable e-circulation counts, and an overall lack of accountability on both the publisher and advertiser sides are keeping the B2B market in the dark in terms of what is being bought and sold. Publishers do not have a consistent selling proposition or differentiation, and surprisingly, they don’t care if you know it. We only have ourselves to blame. This is not an indictment of print advertising. We love print advertising. It is an indictment of a process gone bad. We receive more than 1,000 magazines each month in our offices. One of those is Vogue. Its March 2012 issue has 608 pages with a four-page gatefold cover. You might ask: What does Vogue have to do with advertising in business-to-business (B2B) publications? Our answer would be twofold: “Nothing. And, everything!” Vogue is doing what B2B publications used to do: They are maintaining their relationship (affinity) with their readers. They make a promise to people who receive their magazine, and they keep it. Vogue also has a robust website, which does things the print magazine either doesn’t do or can’t do. And, the print magazine does something very important the website can’t do: exist outside an electronic portal (try unfolding a four-page insert on a computer!). And it’s not just Vogue. Magazines aren’t going anywhere (http://goo.gl/12KC2 will take you to a discussion of the Economist Group’s chief executive, Andrew Rashbass, who says the problem with most magazines today is that they have traded the courage of their convictions for commercial interests). Each month, we receive new ones, and some of the older ones stop coming in. The age we live in is volatile, and there is disruption going on. But amid all of this turmoil, the thirst for information is greater than it has ever been (http://goo.gl/UFnXW). B2B magazines’ proposition used to be clear: They would provide a targeted audience that advertisers could access for a fee — by purchasing ad space. That proposition, as we will demonstrate, has been corroded for many reasons, not the least of which is neglect. Some major changes have taken place in that proposition in recent years. Publishers have lost their grip on their controlled audiences and opened up access to anyone who wants it, thus nullifying their core proposition. The Internet has helped shape this corrosion and confused advertisers. This series of white papers— based on weeks of meetings with magazines, their representatives and our experiences — attempts to help you sort it out. For the past 20 years, Accountability Information Management Inc. (AIM) has researched many topics. But, the subject area that AIM has studied most completely and from a number of different angles has been the media channels that support the B2B marketplace, and more pointedly, the effectiveness of advertising running in print and electronic media. Since the publication of its original article in MARKETING RESEARCH magazine in 1990, “Behind the Numbers,” where we argued about the relationship between seeing and reading scores to inquiries, AIM’s research into advertising behavior has been in a unique position. AIM has conducted numerous publication-sponsored research projects into circulations and inquiries, as well as independent, third-party studies relating to advertising reach and impact, how readers prefer to receive information, what specifiers and decision-makers do with the information, and more. In addition, AIM has built a database of seeing and reading scores in excess of 1 million impressions in a variety of markets. These measurements, compiled by independent auditing research companies such as Starch and Harvey, produced a benchmark against which AIM was — and still is — able to identify what we call “creative factors” in advertising to generate increased awareness and response. Today, AIM is affiliated with a leading advertising and marketing communications organization in the B2B field, Interline Creative Group Inc. (www.interlinegroup.com), which also supports the sales and marketing efforts of B2B companies that use advertising, as well as working relationships with many publications in a variety of fields. But, our world is changing. Perhaps better said, the way information is distributed and received is changing. That means what is and is not advertising is changing (http://goo.gl/RDRND). These changes are profound and irreversible. They impact entire industries, devastating some and creating entirely new ones nearly overnight (e.g., Pinterest). Therefore, a study of these changes in the flow of information will affect media and media purchasing. For example, Google’s advertising revenues are now bigger than the entire U.S. newspaper industry combined, according to new figures published by the Newspaper Association of America (Google ad revenues bigger than entire US newspaper industry [print is dead] by @gordonmacmillan, posted on 16 March, 2012 at 12:41 pm). The increase in delivery via mobile is yet another factor among the many shifts taking place. Add social media channels, and one can easily see the disruption taking place. This disruption has spelled disaster — and opportunity — for B2B publishers, who have traditionally relied on the model of having a clearly defined audience offered to advertisers, an audience that was verified yearly so that advertisers knew they were reaching “the right” people. This “reach” was critical in the B2B channel, which is often characterized by many influencers who can, at any moment, disrupt the sale of the product. In the past, B2B publishers identified an audience, gathered it around their brand, and then offered advertisers a chance to reach these qualified people through advertising. When the Internet emerged, these publishers moved quickly to that channel, seeing the opportunity to save a lot of money by offering both print and digital advertising opportunities. This further splintered the connection between advertiser — publisher — audience. 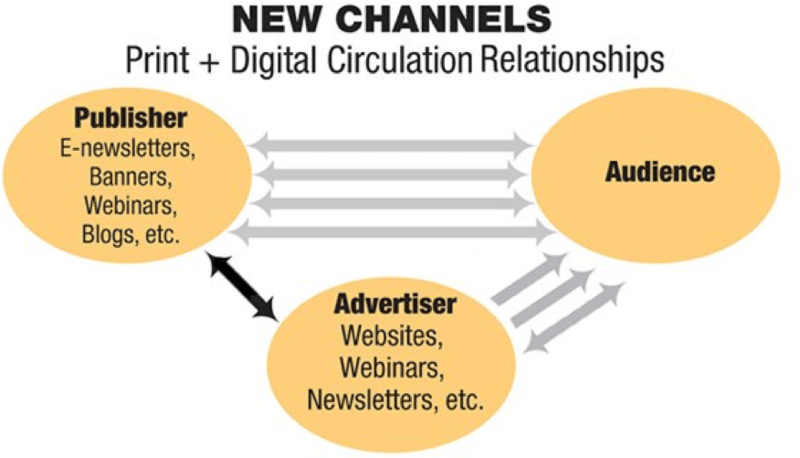 We no longer know as media buyers exactly what we are buying in B2B and what is at the heart of the changes media buyers face — is what is it we are all buying? Why we are so unsure of what we’re buying in media today is the essence of this white paper series. We’ll uncover why some of these questions remain unanswered. Our contention is this: Ultimately, only the advertisers — not the publishers — will be able to truly answer what they’re buying anymore. In Part 2, we will examine who the readers are of publications, and how you can tell who the readers REALLY are. For more information on AIM or our sister companies, or for a complete set of our white papers on this topic, please fill our the form on our website, tell us a little bit about who you are, and we’ll send you the report. Thank you for spending some time with us.